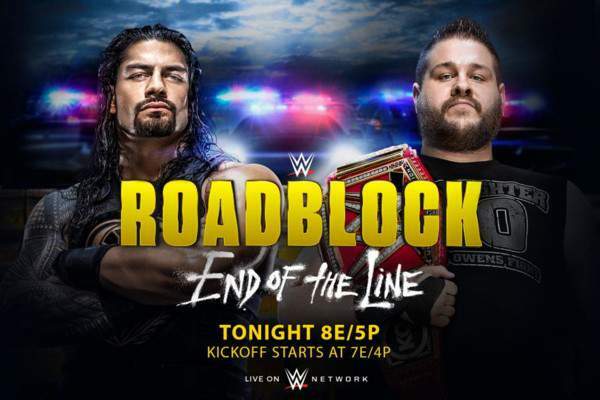 WWE RoadBlock 2016 Results: The first ever RoadBlock pay-per-view (PPV) of WWE earlier had taken place in 2016. We got to see all the current wrestlers at that time. However, the Raw adopted it after the brand split. With it, RAW attached an intriguing tagline “End of the Line” to it. The main event for this installment of Roadblock is going to be the match between the current Universal and United States Champion. Kevin Owens will fight Roman Reigns to defend the title. Chris Jericho has a planned game against Seth Rollins. Sasha Banks and Charlotte will take on at the women’s front. Until the PPV starts, please read further for its preview and match result predictions. The complete game card is given below. Check: Miss World 2016 Winner. The feud came into existence when Enzo Amore encountered Lana (Rusev’s wife) naked. Rusev entered into to defend the honor of his wife. Their match is touted for the pre-show tonight at Roadblock. It is going to be his first test as a singles competitor. WWE seems to establish Cass as a dominant character. The 7-feet superstar is likely to win. The New Day has made the record of being the longest reigning Tag Team Champion in WWE history. Earlier, Demolition held this record for 478 days. However, many criticized the way the team kept this tag for so long. Now, it looks like the end of their spell is very near. They may further continue holding onto the title and move ahead into Royal Rumble as champions. Zayn is considered as an underdog and will fight undefeated Braun Strowman. Mick Foley took a test of Zayn’s fighting spirit. At first, Foley was reluctant for this match. But, in the end, he granted Zayn his request but for 10 minutes only. Both the stars have equal chances to protect themselves. Rich Swann had the most momentum among the Cruiserweights. He was the winner of the first episode of 205 Live and placed at the top for his loveable babyface. TJ Perkins didn’t fare the role. The triple threat with Brian Kendrick will spice things up. Swann will look forward to capitalizing the opportunity. WWE will want him to win. The feud started nearly four months ago when Seth Rollins started his mission to get to Triple H. Rollins said that before getting to Triple H, he needs to get Kevin Owens and for that, he needs to get through Chris Jericho first. On an interesting note, this is the first PPV for him after the Wrestlemania 31. The Architect is expected to win as he has overthrown Jericho in some matches on RAW in the past. The historic feud will come to a conclusion this time. Their feud started at the end of June 2016. They made history with their match going as the main event at Raw many times. Also, they headline a PPV. Moreover, they also had the first Women’s Falls Count Anywhere match and the first Hell In A Cell women’s game. The most criticized thing between the two is the exchange of title between them every month. As a result, both the women have been now 3-time women’s champions. Sasha Banks won every time at the Raw while WWE maintained the undefeated streak of Charlotte at the PPVs. Earlier, it was supposed to be the match of Charlotte vs Bayley, but the plan changed apparently. This may blow off the feud completely. Roman Reigns has got the chance to become the double champion. He just needs to defeat Kevin Owens. The fight has been overshadowed by the friendship tensions of Chris Jericho and Kevin Owens. Jericho may help The Prize Fighter to win over The Big Dog in a swerve change. Owens may remain the Universal Champion until the Royal Rumble at least. Roman may enter the Wrestlemania 33 holding the Universal title. Thus, he may have to wait a little bit longer.